You are currently browsing the tag archive for the ‘Shochikubai’ tag. 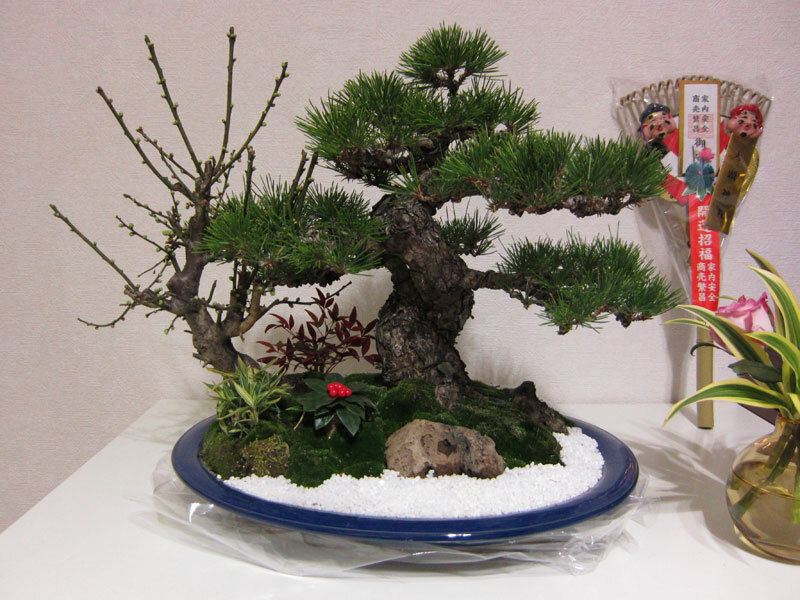 Shochikubai is a type of planting sold at New years time in Japan to bring good fortune for the coming year. The below example was one a friend had bought and was on display in their apartment when I visited. Shochikubai (松竹梅) is a chinese reading of the japanese kanji: matsu (pine), take (bamboo) and ume (plum). The pine represents strength, the bamboo longevity and the plum stands for beauty and optimism. Around the New year you would see these pop up at businesses, department stores and homes across Japan. This is probably the closest Japan comes to ‘Mall-sai’, although I think that this pine has a lot more promise than any I have seen for sale in shopping centres here. How long these plantings survive outside of the new year period is hard to say, my friend’s planting is still alive but I am not sure for how long. They don’t have a history of green thumbs and they live in a small apartment with a small balcony, not ideal bonsai conditions. Come to think of it, I don’t remember seeing any really established ones anywhere else which might suggest their survival rates are similar to the expected survival rates the mall-sai we get here. No matter what the future holds for these plantings, I think that any year starting with a black pine bonsai is going to be a good one!